Facts about Georgia Peach Water Lily. Georgia Peach is a free flowering lily. It is an excellent hybrid that can survive in a variety of conditions including confined environments. It starts blooming in summer and goes all the way giving a brilliant display of peach colored flowers. Being a hardy water lily, the Georgia Peach Water Lily is highly adaptive and has an impressive survival rate. Georgia Peach Water Lily is a profuse bloomer that will not stop flowering even if it is confined. This sets it apart from other lily species which tend to bloom only under specified environmental conditions. The flowers are usually held high above the entire foliage complex even in young plants. If you want to witness the onset of Georgia Peach Water Lily blooming, summer is the best season of the year. To be exact, the blooming season starts from May all the way to October. However, the timing may vary depending on the prevailing environmental conditions. During high summer, the Georgia Peach Water Lily develops a subtle and pinkish peach color. 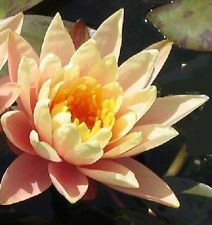 The petals which are also peach colored are usually held between 6 and 8 inches (15 to 20.3 cm) above the water. The foliage color is bright green which is conspicuous even from a distance. The lily pad measures about 4 to 8 inches (10 to 20.3 cm) in diametrical width. Because of the fact that the Georgia Peach Water Lily is not variegated, it requires much more sunlight than other species which are variegated. During planting, it is recommended that you grow 2 to 3 water lilies in a surface area measuring 10 square feet (3 square meters). When you are growing Georgia Peach Water Lily in a confined setting, ensure that you apply fertilizer in quantities of 3 to 4 tablets on a monthly basis. This will give the plant adequate time to absorb the nutrients while at the same time giving space to the natural environment to play a role in the growth of the lilies. The hardiness zone of the Georgia Peach ranges from zone 3 through to zone 12. What this means is that the lilies will survive the winter with no prep work required.